See our brands in the news and media! "Magic Cup Cafe: This shotgun-house-style restaurant is based in Dallas and Houston. It is dimly lit and filled with comfy chairs, modern decor, and loads of board games. The real charm of this place is in the food. They carry Asian fusion dishes such as their Pho-Nomenal dip, a mash-up between pho and a French dip sandwich, and kimchi fries loaded with Sriracha-mayo, shredded cheese, green onions, and sesame seeds." 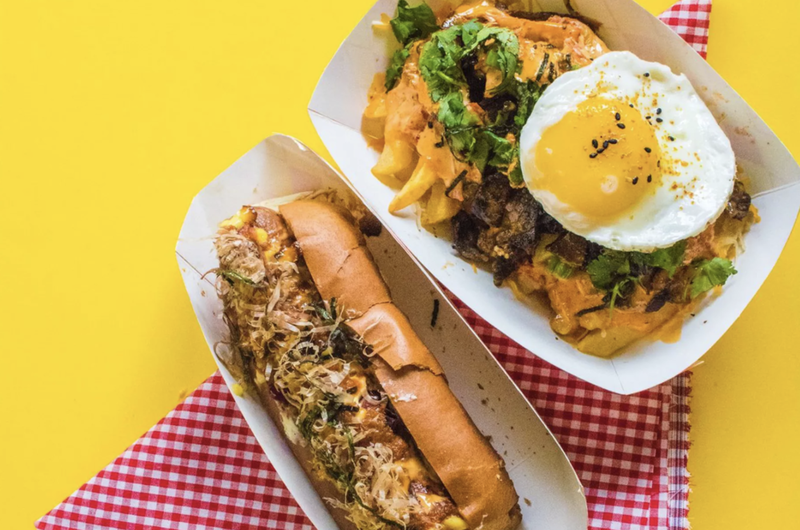 "Spicy Dog’N Go: All-American dogs get an Asian kick at this fusion-food trailer, which pops up at spots like 11 Below Brewing Company and Under the Radar, in addition to its regular Montrose location. Stop by for buttery, toasty buns stuffed with 100 percent beef dogs and outside-the-box ingredients like garlic-butter cream cheese, Japanese mayo, teriyaki sauce, shredded nori, and Flamin’ Hot Cheetos dust. Sides include Japanese Bob-B-Q Fries and deep-fried mac ‘n’ cheese Bop Balls drizzled with truffle aioli and furikake seasoning." "Located at 11215 Bellaire Blvd. in Houston’s Asiatown, Ocean Palace began renovating its bottom floor in March, according to a press release and a spokesperson. This first phase of construction is expected to finish in August, and then the second phase will begin, which involves renovating the top floor." 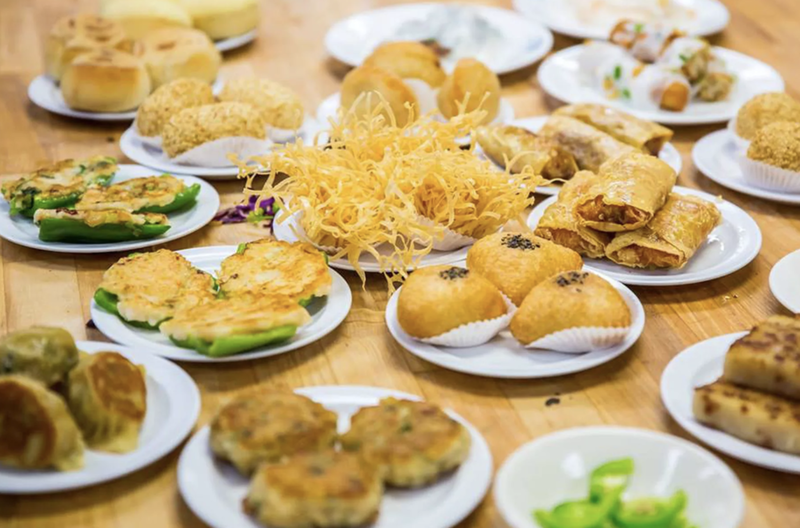 "One of the largest dim sum restaurants in Bellaire is getting a whole new look. Ocean Palace will unveil its interior renovation with a grand opening at the end of this summer, giving the dim sum destination that opened in 1998 a major revamp." "Food truck Spicy Dog has inked a deal to build a new storefront at 2723 Yale St., co-founder Oh Peou told the Houston Business Journal. The brand has only been operating for five months in the food truck. When it opens in October, the concept will go by the name Spicy Bear, employ 12 people and seat between 25 to 30 guests in about 1,500 square feet of space, Peou said. Eater Houston reported the location is inside Ancorian’s Yale Crossing development." "Darryl de Mello, the man leading our Asian Heritage Tour through Houston’s Asiatown on a recent Saturday morning, whipped through the things to know about the place"
"it’s possible for a Houstonian to lose himself amid the familiar topography of a strip mall. The double-decker, neon-lit plazas lining Bellaire Boulevard are no joke, and one Friday evening I barged into a Dun Huang eatery hauling an 18-pack of Bud Light Lime to discover I’d arrived not at my intended Fu Fu Café but the Fu Fu Restaurant across the strip." "Dallas-based Lombardi Family Concepts closed Taverna Pizzeria and Risotteria, located in the River Oaks District at 4444 Westheimer, suite A-120, a spokesperson confirmed. A new concept called Bisou under a different owner will open in its place." "Chef Jason Liao and co-founder Charlie Chang are finally getting a brick-and-mortar restaurant after nearly two years of operating Pokéology in the back of Doc Holliday’s in Rice Village. That location closed in May but the new Pokéology is having a soft-opening at 2313 Edwards in the Sawyer Yards center (near new restaurant Poitín) mid-July. The official grand opening is in August." "Spicy Bear, a new brick-and-mortar restaurant from the frat brothers behind the Spicy Dog food truck, is coming to the Heights this summer." "Spicy Dog is a food truck and Asian fusion spot, offering over-the-top hot dogs and more. The owner, Oh Peou, is a co-founder of Spicy Dog who has followed a family tradition; his parents own a food truck in Philadelphia, Houstonia reports." "It was only a matter of time. And ahi. Yes, the first ever poke competition, the Poké Showdown, is heading to Houston on Sunday, June 11, from 6 to 10 p.m. at Bar Bleu, 2506 Robinhood, in Rice Village." "Anxious, hungry poke fans lined up outside of Bar Bleu, 2506 Robinhood, near Rice Village last night for Houston's first ever poke competition. Eleven teams entered the contest and three winners each were presented for judges' choice and people's choice." "Unlike concepts born from private restaurant groups that are debuted to the public by PR machines, these are the little guys, taking it to the streets, bars, parks and festivals, getting their names and food out there any way they can." "Seaside Poke, the highly anticipated brick-and-mortar from the masterminds behind the popular (and former) pop-up at Doc Holliday's, is finally head to 2118 Lamar Street in East Village next month, with a soft opening projected for early May." "With plans to expand with a more complete dining experience in Houston’s Sawyer Yards, the team has synced with NextSeed to bring this tasty plan into fruition. To date, the crowd has invested over $87K toward the $150,000 minimum goal for 13.25% equity." "An aspiring entrepreneur who's about to debut a new dining spot in Montrose is learning that community is what helps build a business, even before it's open." "THERE’S A NEW DOG IN TOWN thanks to Houstonian Oh Peou, co-founder of the soon-to-be-launched Spicy Dog’N Go food truck. Last weekend, Peou and his team were busily prepping their signature sausages at one of the pop-ups they’re hosting this month at Sigma Brewery." "Now, they’re getting a permanent spot on GiAu’s menu along with strawberry shortcake and creme brûlée cocktails, all dreamt up by barman Jacky Lee, who’s been with the company for four years, says owner Julie Vu." "#1. Make the trek to Asiatown for GiAu’s boozy boba cocktails, which combine the absolute best of both worlds. Transparent tapioca pearls are mixed into drinks inspired by traditional black tea and taro milk tea, both spiked with booze." "This Rice Village spot is 100% poke-focused, serving up a selection of build-your-own bowls and standby combinations. Try the Tuna Yuzuviche, made with ahi sauced in yuzu and white soy, and topped with pickled red onions, jalapenos, and pecans." "Sushi chef Jason Liao’s comprehensive training shows in the creative flavor combinations at this Rice Village poke restaurant. One bowl matches hamachi with apple and white shoyu, while another pairs tuna with pickled red onions, pecans, and jalapeno. Pokeology offers build-your-own options, but considering Liao is a martial arts expert, why risk upsetting him by not going with one of his combos?"